Died December 4, 2008 from wounds sustained when a suicide bomber in an SUV broadsided his armored vehicle just 50 feet from his base in Mosul, Iraq. Also killed was SGT Solomon T. Sam. “His family was his number one priority,” said his father, John Savage. His son was expecting to come home and start an automotive business with his when he returned. He said he had two years left in the military and was planning to put in a transfer from Fort Leonard Wood in Missouri to Fort Hood, to be closer to his family in Texas. Jared had spent three years in Germany before deploying to Iraq on his first tour in 2005 before returning home in March of 2007. 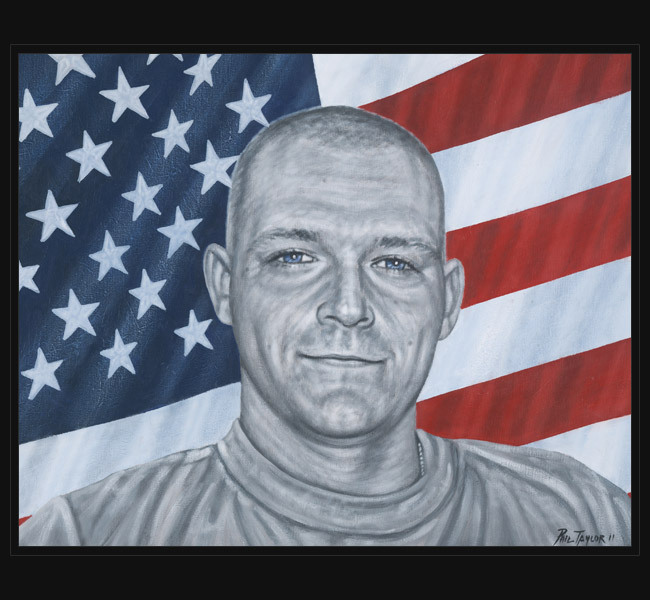 He was deployed again in September 2008 and was due to return home on December 8, 2008, but was killed on December 4. Original portrait was presented April 28, 2011 to his mother during a special event hosted by Tarrant County College, Fort Worth, Texas.